Wow! Yes, yes, and more yes. The Suncoast Campaign for Grade-Level Reading’s 2018 Community Update Breakfast provided many joyful, affirming, and inspiring moments. Flashes from the morning have been playing in my mind and many of the nearly 300 attendees have been sharing their photos, thoughts, and inspirations on Social Media. What made the event so special? There were many elements that added to the joy of the morning. The Suncoast Campaign for Grade-Level Reading is a regional effort to make sure all children succeed in school by ensuring they read on grade level by the end of third grade — so let’s begin with the children. Students from Brentwood Elementary School, Tuttle Elementary School, and Ashton Elementary School surprised attendees with a live performance of the jingle, “Strive for Less Than Five Days Absent” by Jim Prosser and Beth Duda. The students were very excited to have breakfast in such a “fancy” restaurant to show the choreography they had learned from Kelli Karen Smith, and to share through song, the powerful message that outstanding attendance at school will help to propel them to success. The room spontaneously burst into applause when we showed the artful and informative recap video created for us by Bill Wagy. The eight-minute video contained numerous highlights from our work over the past year presented in a most entertaining way. Bill started the video with a nod to GLR week being held in Philadelphia this year, Rocky stairs and all. Was it the well-run registration, room decorations and the warm welcome given to everyone by the exceptional team of Suncoast Campaign for Grade-Level Reading Engagement Team members? There is no doubt the hard work and passion of each member of the team contributed a great deal to the event. From the weeks of planning to the room decorations and set up to the excited early morning smiles shared with each other and all the guests, the contributions from this exceptional group of passionaries cast a glow on the morning. Another contributing factor to the success of the breakfast was the line-up of speakers. I had the privilege and pleasure of sharing the presenting stage with Kirsten Russell from the Community Foundation of Sarasota County, Bronwyn Beightol from United Way Suncoast, Angie Matthiessen from United Way of Charlotte County, Ron Fairchild, Senior Consultant from the national Campaign for Grade-Level Reading, and Debra Jacobs, president and CEO of The Patterson Foundation. Each speaker concisely shared their reflections on the work that has been done in our region and their aspirations for our continued journey. Their contribution was incredibly important, but there was more. Ron Fairchild took the opportunity to honor our region’s inductees to the nationwide Campaign for Grade-Level Reading’s Council of Champions. 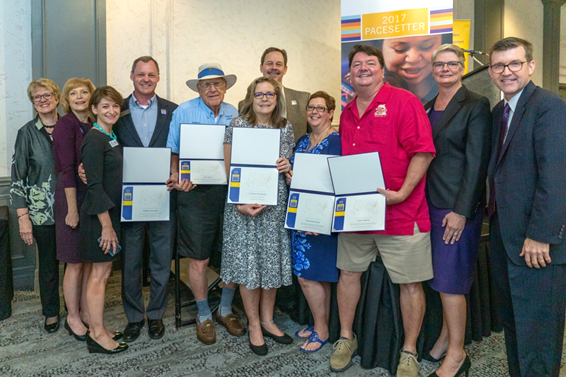 Jim Henry, John Horne, Amanda Horne, Steve Roskamp, Carolyn Roskamp, and William Russell each have made tremendous contributions to the Suncoast Campaign for Grade-Level Reading and the enthusiastic applause and appreciation for each of them was strong. As I play the scenes from the breakfast over and over in my mind, each of the mentioned elements brings a wide smile to my face. The greatest factor in the success of the breakfast was in more than just the sum of those parts. 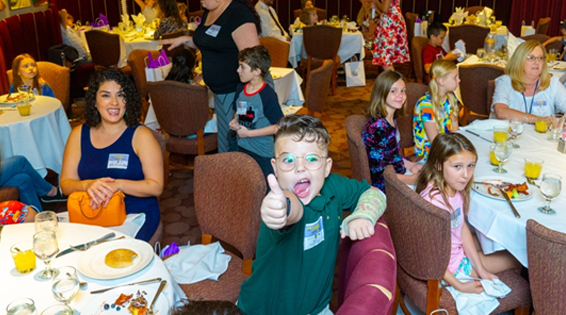 The source of the power was seated at each of the 31 tables in the room —nearly 300 people, each of them with their own individual connection to the Suncoast Campaign for Grade-Level Reading. Individuals from businesses, government, nonprofits, and the media sharing and caring about the children in our community create an awe-inspiring energy source, one that was felt at the breakfast and will continue to support the movement going forward. Our work is far from over. Too many of our most vulnerable children are not receiving the skills they need for success in school and in life, but with the power source in evidence at the Community Update Breakfast we can all look forward to making progress together.